Only one year after the excellent “Cauterize,” Mark Tremonti and his band return with another ten tracks; billed as a companion piece to “Cauterize.” Anyone fearful that this would be “Re-Load” to “Load “can settle down. It isn't. The record continues with “The Cage”, which again exhibits some fearsome rhythm skills from Tremonti and changes pace effectively for the verse and main refrain. The sound is thick and crisp at the same time. Again, the drums have a real power to them (as they did on the previous two albums) and the bass is fully audible, underpinning the sound and giving it a real thickness. This is, in fact, the sound of modern rock; a kind of well produced melodic hybrid of rock and metal. Cracking solo too! “Once Dead” keeps the energy levels right up there in the red before the melancholy title track comes in; acoustic guitars open proceedings and the track stays mean and moody from there. Similarly “Betray Me” is also melodic, but not without muscle, with a searing solo down the home straight. “Tore My Heart Out” is, as the title suggests, a fairly dark affair- perhaps closer to Tremonti's day job in Alter Bridge- exhibiting as it does some strong vocal melodies to go with the downcast main riff. There are some nice melodic lead breaks in this one, too. The solos are not scrimped on either; a soaring and majestic beast it is. The track finishes with an unexpected change of tempo to thrash pace. Nicely done! The opening of “Catching Fire” is full of foreboding sounds and then the track rocks out hard with lock-tight guitar and a similarly unified rhythm section. The time change half way through makes for an inspired run through a thrashing section of riffage. The strong hooks of “Never Wrong” work very well indeed as the bass roams all over the fretboard with a lovely warm sound. The crushing mid tempo/double time riffs of “Rising Storm” see the band play together superbly and Tremonti's vocal shines too. Dynamics get some good usage in this one too. 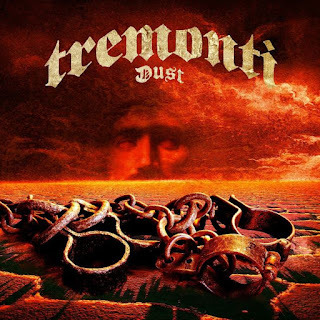 “Unable to See” is the tenth and final track and is a ballad- a shame, from my point of view, as Tremonti could have really brought home the album with a shredding finish. That said, it is a fine song and features, as usual, strong melodies, playing and soloing. Certainly, “Dust” is every bit as good as the preceding two solo records and maybe even a bit better. It mixes metal, grunge, rock and hard rock together very effectively and could well act (as noted in my review of “Cauterize”) as a bridge for fans into more underground music. To summarise and put things simply: this is modern hard rock/metal of the highest quality. Anyone with an interest in the heavier side of great musicianship and song writing should find something to enjoy here. Business as usual for Mark Tremonti and band, then.